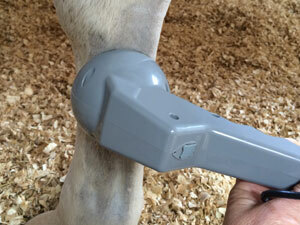 Presentment: 10-year old dressage horse with desmitis at the origin of Suspensory Ligament. Treatment: Treatment 3x week with laser for 8 weeks (24 total treatments), Luminex Ultra 5W probe (808nm), dosage was 6 joules/cm.sq for first 4 weeks, 8 joules/cm.sq. for last 2 weeks. 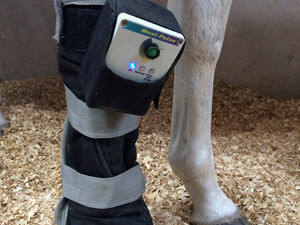 This horse was also treated 3x weekly (24 total treatments) with Maxi Pulse PEMF legging for 30 minutes each treatment. PEMF therapy continues twice weekly for conditioning and maintenance. 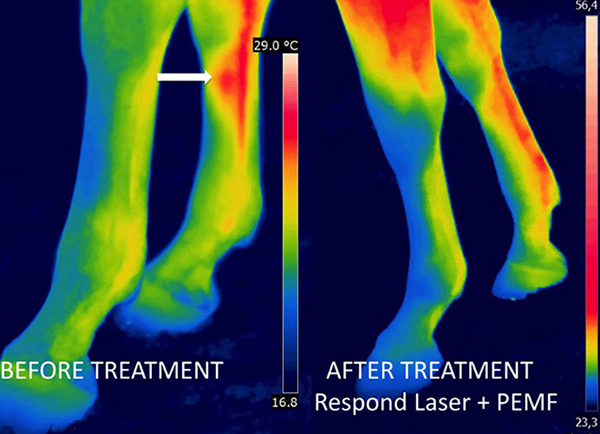 Results: Horse was evaluated by thermography, and again 25 days later. Note how the inflammation pointed at the arrow is gone. Horse returned to competition (show jumping), and owners reported no recurrence of the condition as of December 2015.